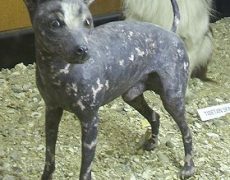 The Abyssinian Sand Terrier is an old and very rare breed of hairless African dogs that is not so well known. 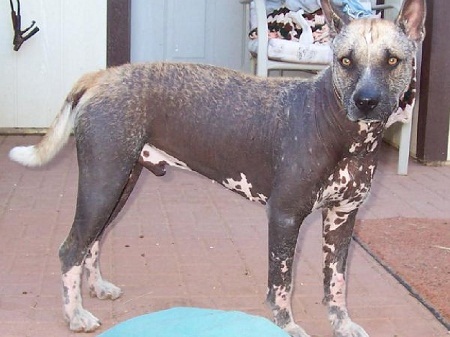 This breed practically does not have hair on its body, except for a few tufts on the head and the tail, while some individuals are completely hairless. The skin tone of this dog varies between different shades of grey, often with dull pinkish blotches scattered randomly. Abyssinian Sand Terriers have bat-like ears, a black nose and an elongated, tapered muzzle, bright round eyes, an arched neck and long slender legs. The body is sleek with a thin, twisted tail, while the chest and the stomach are parallel to its back. The Abyssinian Sand Terrier originated somewhere in the continent of Africa, however, the actual origins of this breed is unclear. History says that, hairless dogs, AKA naked dogs, have always been a matter of mystery, and like other early hairless breeds, the Abyssinian Sand Terrier was thought to possess magical healing powers. The dog’s furless, warm body was effectively utilized as hot compress for pains and aches, and also for warming the bed during winter. 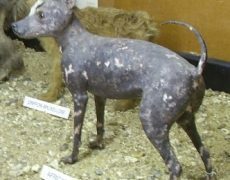 Experts believe that these dogs were used to develop a few of the modern-day hairless breeds like the Chinese Crested dog. 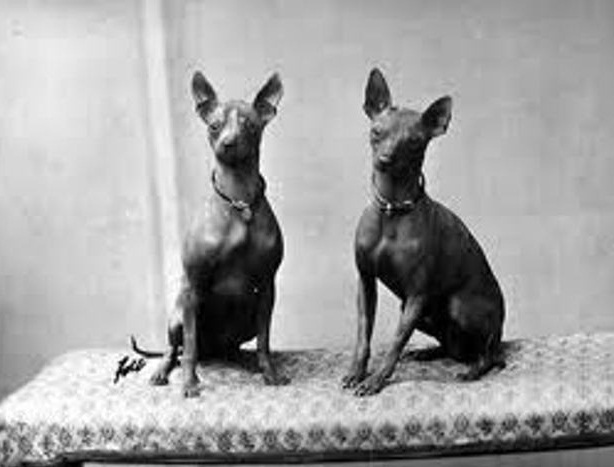 Though they were taken to several parts of Europe, including Britain, they somehow failed to appeal to the dog lovers from Britain probably because of their ‘naked’ looks, which might have been apparently ‘gross’ to many. Interestingly, many individuals of this breed are unable to bark until they are taught to do so, kennelled with other normal dogs. However, they are fearless, and would display protective behaviour to defend you and your house. The Abyssinian Sand Terriers are affectionate dogs that are willing to please their owners. They are great with children and fellow pets, including other dogs. Abyssinian Terriers love to move around and run, and hence, requires some moderate exercise every day. Take them out for a walk or a jogging since they make a good jogging partner and specifically enjoy running alongside a bicycle. Ask your kids or involve yourself in some playing sessions daily. Since they are practically hairless, they need extremely nominal grooming. Bathe them as and when necessary, so that the skin does not dry out. You can also use a clean, damp cloth and apply moisturizer or body lotion from time to time, consulting your vet. 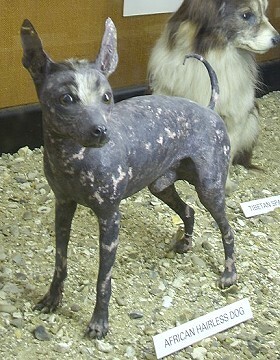 Abyssinian Sand Terriers possess a sensitive skin and are much more prone to catching skin diseases (including skin cancer) than the other hairy breeds. They have no or very nominal amount of hair, and hence, care must be taken to keep it warm and comfortable during the winter months. Also, refrain from keeping it exposed under direct sunlight for too long. Since they are quiet by nature, and many puppies do not bark at all, they are not always able to express themselves or interact with you properly. Such a hindrance might at times lead to certain mental imbalances in your dog that might make it disobedient. Begin obedience training at a very early age when it is still a puppy. General diet meant for medium size dogs is recommended for the Abyssinian Sand Terrier breed. 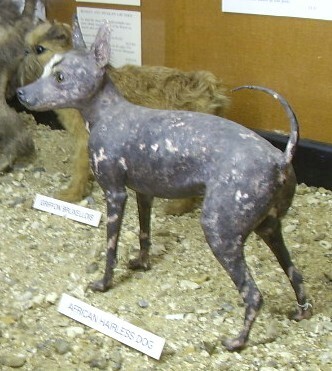 A stuffed specimen of this breed has been put on display at the Walter Rothschild Zoological Museum in Tring, England.